A lot has happened since my last post here... I turned 62 in September last year and around the end of October I joined the ranks of the retired. I parted company with BMW, Agile 1, Renfrow Brothers and OpSource all in the same instant. My tour of duty there lasted almost 9 years... longer than I have been anywhere. It was an interesting ride but glad its over. BMW pays well... has good working conditions.... but the management mindset and treatment of employees there create an environment that is adversarial to put it mildly. Agile 1, Renfrow Brothers, OpSource, and BMW for that matter.... are the modern day equivalent of the money changers on the steps in biblical times. They all ask much of contractors and take their piece of your pay.... BMW to subsidize benefits for real employees.... the rest to subsidize benefits for themselves... as you get none. On November 30th of last year... I lost two huge buildings behind my house that were full of all manner of handyman collectibles and implements of creation. A bit mind boggling just how much stuff was out there. A bit of a game changer as well to go from having the capability to make most anything of wood or metal to not having the tools or place to do much of anything. Unfortunately the electrick trike and a ton of bits and pieces for a few more all went up in smoke. 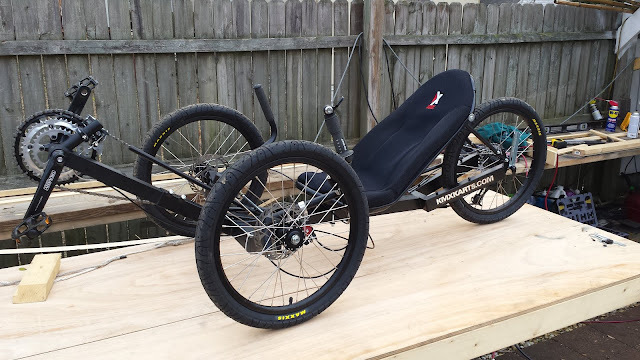 I did buy two more trikes with the intention of doing some more electrick trikes but its likely to be some time before that happens. So in the meantime I'll just be riding them the old fashioned way... peddling.